WESTBROOK — Since opening in 2010, the Westbrook Community Center has been a hotbed of activity, in the last week alone hosting meetings, training, community meals, exercise classes, swim sessions and music lessons, along with pre-K, before-school and after- school programming, a pool party and an American Red Cross blood drive. A new communication system approved by the City Council at first reading Sept. 10 will help employees and tenants in the midst of the action stay better connected, especially in the event of an emergency. Second reading of the $22,421 system from Wolf Technologies in Windham is scheduled for Sept. 17 and Interim Community Services Director Greg Post said if all goes well the system could be fully operating by Thanksgiving at the latest. The upgrade to the existing telephone system will give community services’ central office or security desk the ability to reach any room in the building that is equipped with a phone. The system will also allow tenants and employees in other parts of the building to connect to the central office and other rooms if they see a suspicious or dangerous individual in the building or in the event of a lost child. The system, Post said, can also alert a particular room, say the Westbrook Food Pantry, that a delivery has come into the main office. “In an emergency, we can see it unfold, but can’t communicate to everyone right now. We use walkie-talkies, but there are a lot of what ifs with that. It is charged? Is the person carrying it? Is the volume up?,” Post said. 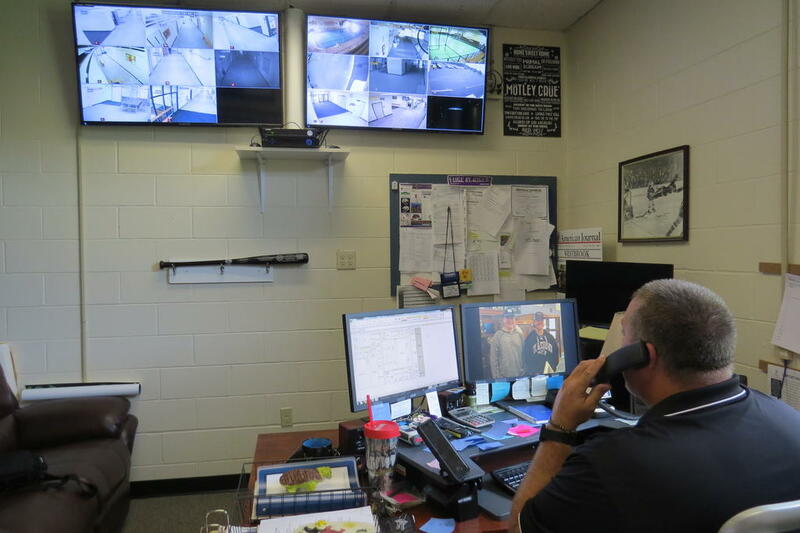 The system, Post said, gives his department the ability “to notify anyone at anytime in any room for anything.” It also gives the Westbrook police and fire departments or other public safety agencies the ability to tie into the buildings video system and communicate, something not possible now. It can be used as an intercom system to alert the whole building during big events, such as swim meets or basketball tournaments, if there is a car parked illegally in the parking lot. Post said other community centers in the area have similar communication systems. “There hasn’t been any sort of incident that has spearheaded this. (Security improvements have) been gradual, but desperately needed,” Post said. Several years back, upon advice from the Westbrook police and fire departments, the city took a look at limiting access to and from the building’s nine entrances. The public now can only get in and out of the facility via two entrances. Last summer a new security/reception desk was added to one of the main hallways to give staff working there sight lines to everyone coming in and out of the building, and over the years the city has added security cameras to monitor common spaces in the building, such as hallways, entry ways, the pool and gymnasium. Post said eight more cameras need to be added: five or six interior cameras and two or three exterior cameras. Council Vice President John O’Hara encouraged Post to make sure the video streams and new intercom system are tied into the building’s generator so the systems capabilities are not lost should the building lose power. Post said the security improvements have been balanced with the intention of keeping the building a place where the community feels at home. “We want to be secure and safe, but we also want to be open for the community. We don’t want to make this feel like a prison, Maybe something someday will necessitate a change, but right now we are satisfied with the (security) and people being able to come in, see what we offer and be able to participate in things,” he said. Interim Director of Community Services Greg Post monitors security video streams at the Westbrook Community Center last week. A phone system upgrade may be installed that would offer a better way to communicate between areas during an emergency.